Before you can welcome love into your life, you have to let go of deep-rooted anger and resentment and forgive those who’ve hurt you, even if they don’t seem worthy of your forgiveness. 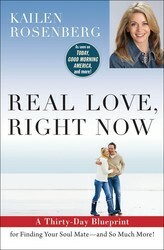 Find out more about this path to healing in the book Real Love, Right Now. As someone who suffered the abuse of my stepfather as a child, it is still at times painful for me to hear clients’ stories of abuse—whether they are the abuser or the one who was abused. It has taken a lot of work for me to be able to go to a place of love and understanding instead of judgment when a client tells me that he or she has been abusive to their family. I can do this only because I have learned that my stepfather abused my mother and me because he was disconnected from love and so deeply hurting, too. It was his own brokenness that caused him to act away from love. When someone is connected to themselves and healed from their own wounds, they don’t act in hurtful ways to others. If someone is acting in a hurtful way, it shows the reality of their disconnect from the love in themselves. This is why it is so important to connect with our true selves before we can experience both giving and receiving love with someone else. Forgiveness can be difficult at times, but it is the only way to heal. When we are stuck in a place of anger and judgment, we disconnect from ourselves and begin to act away from love. There is no room there for healing. The same cycle occurs when we fail to forgive ourselves for our own actions or perceived failures, but when we choose to forgive ourselves, we create a pathway toward healing. It is then that love can enter. Kailen Rosenberg is the founder of The Love Architects matchmaking service, relationship expert for Minnesota’s Cities 97, and host of OWN’s show Lovetown USA. She has appeared on the Today show, Good Morning America, and CNN, among others.